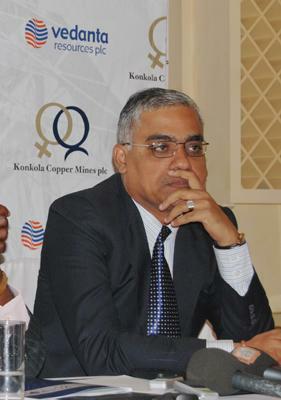 Konkola Copper Mines (KCM) Chief Executive Officer Kishore Kumar has been deported to his native India after the mining giant defied ailing dictator’s Michael Sata directives that KCM should not lay off a single worker from the bankrupt Zambia’s mining giant. It seems Kumar was departed after telling labour minister Fackson Shamenda that Sata’ directive was a mere rhetoric. KCM laid-off 76 workers and more are still going as the mining firm is totally bankrupt and barely surviving on borrowed money. But the information reaching the Zambianwatchdog indicate that dialogue has again eluded this nation as the CEO has now been deported at short-notice on instructions from Mr.Sata. It is now increasingly becoming clear that the Zambian government might revoke the mining licence and close the mine as the government also has no capacity to run KCM or indeed find an investor in the shortest possible time, especially with the prevailing low copper prices coupled with unsound investment climate in the country. And Labour and Social SecurityFackson Shamenda says Government will not tolerate Konkola Copper Mines (KCM) management’s “arrogance” of defying President Sata’s directive that no miner be retrenched from the mine. He has also said that it is intolerable and insulting of KCM to regard President Sata’s directive as “mere rhetoric”. Mr Shamenda said this in the wake of KCM reportedly retrenching 76 workers just days after President Sata’s warning against KCM retrenching any miner. Mr Shamenda says Government will not tolerate KCM’s arrogance. The minister said he summoned KCM chief executive officer Kishore Kumar and Mineworkers Union of Zambia officials yesterday for a meeting as a follow up to the one held on Wednesday and that KCM management denied issuing retrenchment letters to its workers. “We are not going to tolerate arrogance from any employers. They are not the only employers. They may claim to be the biggest, but they are operating in an environment where all mining companies are important…Nobody is going to blackmail us. “The President has said if there is any investor who is becoming irresponsible, we revoke the licence, then give it to somebody who is going to be responsible,” he said. Mr Shamenda said he was not aware of the lay-offs at KCM until he read about the matter in the press yesterday. The minister said he had a meeting with Mr Kumar on Wednesday during which he conveyed President Sata’s message to the mining company but he was surprised that a day after the meeting, KCM retrenched some of its employees. “The President directed that I should convey the message from him, which I did yesterday (Wednesday) evening at Parliament. “Arising from these discussions and latest developments, I have asked him (Mr Kumar) again that I should have a meeting with him at 18:00 hours today (yesterday),” he said. Mr Shamenda said he is also disappointed with the attitude and conduct of Mr Kumar who, after the meeting, described President Sata’s threat to revoke KCM’s licence as a “mere rhetoric”. “I was very disappointed with his attitude after the meeting where he was calling the President’s threat as mere rhetoric. That was an insult which I am not going to tolerate,” he said. On the retrenchment of 83 workers at Lumwana Mining Company Limited, Mr Shamenda said the mining firm has been systematic in the manner it lays off its workers. He said Lumwana has been a responsible employer, adding that as the company expands its prospecting arrangements, more jobs will be created. “The Lumwana job cuts have been very systematic. That was a prospecting project and it had a lifespan. With Lumwana, it is a very good institution, we are aware of what was happening,” Mr Shemanda said.